Understand one thing to know about the whole CLOVERFIELD franchise -- I like it. Nay, I dig it. The original was quite a fetching found-footage film, featuring an interesting monster and a premise that seemed ripe for mining and digging on new material. The supposed "sequel," 10 CLOVERFIELD LANE, practically reinvented the idea of sequels in spectacular format, opting for a slow-burning sci-fi thriller. It was a sleeper hit, no doubt. But THE CLOVERFIELD PARADOX? We know, it does still sound like a lot. But when compared to Netflix's other sci-fi-type flick, BRIGHT, those are small numbers. BRIGHT racked up an astonishing 11MM views in its first three days, making it the most-watched Netflix original film to date. And that movie's an original original; it wasn't even a franchise (well, now it is). That Begs the Question: Why Did This Film THE CLOVERFIELD PARADOX Tank so Badly? Aside from the fact that Netflix is now a juggernaut of movie/series production power, no doubt (*ahem*, STRANGER THINGS, THE CROWN, ALTERED CARBON, etc. etc. ), the streaming giant did shell out a wicked $50MM from Paramount just to own the right to launch this film. And only after a total of seven days, this movie raked in just 5MM viewers total. Call it a loss, we guess. But why? Like I said, the CLOVERFIELD films are quite the pleasure. I no doubt will enjoy the new flick with fervor as I try my damndest to connect the three films together somehow (honestly, that's part of the joy and entertainment of this franchise). However, there are four really important reasons why Netflix sadly slightly dropped the ball on this one (although quite frankly, they're swimming in money so much that they're not worried). THE CLOVERFIELD PARADOX unfortunately has quite the nasty Rotten Tomatoes rating: 18%. We know what you're thinking, though: ratings don't matter! And we get it. If we like it, we like it; it doesn't matter what film reviewer didn't like it. After all, BRIGHT got creamed by critics as well -- and yet, the damn Will Smith vehicle was an incredible blockbuster. After all, marketing matters. That's why you get trailers long before the film comes out. You pretty much left viewers blinking at what this immediate trailer (and film following the Super Bowl) was. And, sure, it tweaked the curiosity. But not enough as the traditional marketing model would do for other films. Right after the Super Bowl, no less. When you think about films, at best studios prepare for either a Friday debut or Thursday debut to take advantage of weekend ticket sales. PARADOX went outside of the box for that one. Also putting it in direct competition with football probably wasn't a smart move. You then had the beginning of the week -- Monday, Tuesday, Wednesday -- and that's not conducive to movie-watching by any stretch, no matter how much you like to Netflix and chill. 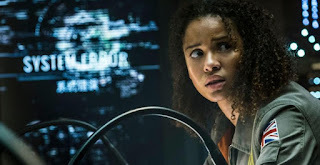 Reason #4: More Importantly, THE CLOVERFIELD PARADOX Really Didn't Have the Knockout "Star Power"
Now don't get me wrong: Daniel Bruhl and Gugu Mbatha-Raw are no doubt talented; but they're not brands. Not like, well, Will Smith. There's a reason studios clamber over the big names of acting: star power's big. It tends to propel a film further into money-making. We honestly think perhaps if Netflix was game for going with more well-known actors -- like, well, John Goodman (a surprisingly inspired choice for the lead villain in 10 CLOVERFIELD LANE) -- PARADOX might've done somewhat better. After all.... It got people talking! It was an ambitious gamble, and at the very least, PARADOX is at this moment a marginal success.... 5MM viewers. And only after seven days. Compare that to theater debut with ticket sales, and that's more than $50MM. Not too shabby. But not on the same level as what Netflix is used to doing. What do you guys think? Did you enjoy THE CLOVERFIELD PARADOX?